If you find yourself wanting to get out of the house a little more than usual, it may be for good reason. Your home may be giving you the blues, or even worse, it may have some serious negative effects on your body. Plants can remove harmful volatile organic compounds in the air. It’s recommended to keep a small plant in each room of the home. Each day, most Americans move from one built environment to another. For those spaces, designers and owners have put thought (be it very little or a lot) into how to set up those spaces and what amenities to install. All those decisions impact the mental and physical well-being of individuals. Our home is a place where we seek refuge. However, many houses face design hurdles or have amenities and features that could produce negative impacts on our health. Here are six ways your home may be bringing you down. Dr. Robert Brown, the author of the recently released “Toxic Home/Conscious Home: A Mindful Approach to Wellness at Home,” said many homeowners may not realize the effect their home has on their ability to enjoy a good night of sleep. One of the primary reasons for disrupted sleep may be tied to technology. Light from phones and laptops, along with electromagnetic frequencies from Wi-Fi routers, will disrupt the body’s pineal gland from producing melatonin, which regulates sleep cycles, the physician explained. “Even looking at your laptop or cellphone for a time before going to bed, studies have shown it can delay the production of melatonin by your brain,” Brown said. Even if a modem or router is in a distant room, precautions should still be taken. “EMF travels a good distance, and the brain receives information. … I recommend people put it (routers or modems) on an appliance timer so it shuts off automatically (at night when sleeping),” he added. Consumers are more conscious than ever about paints containing harmful volatile organic compounds and other products that may bring air toxins into the home. However, they are often misled on two points when it comes to in-home air quality, Brown said. When it comes to VOCs, air purifiers like HEPA filters do not remove them. Plants do. That’s why the physician/author suggests keeping a small plant in each room of the home. Home filtration systems, such as HEPA filters, do eliminate micro-particulates found in air fresheners, candles and even fumes from cooking. On another note, Brown strongly advises against using any plug-in air fresheners. “The association you may have with a fragrance may affect emotions, but it’s not the same with an air freshener, even though it may kind of smell like that fragrance. It doesn’t have the same reaction,” he said. 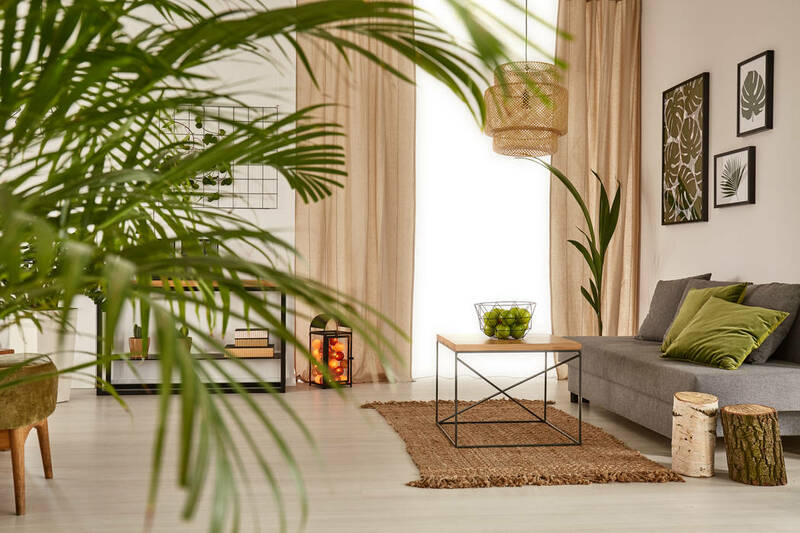 A home’s lighting can strongly impact mood, adds Atilla Lawrence, an assistant professor of interior architecture and health care design at UNLV. More specifically, full-spectrum lighting, which covers the full magnetic spectrum from infrared to near ultraviolet, promotes a good mood, the professor says. Natural sunlight is considered a full-spectrum light. “It will help you be more energetic. It’s going to put you in a much better mood. … It supports the circadian rhythm,” he added. If you are in the design stage of a home, Lawrence said, a lighting pro who can design a space with ample natural full-spectrum lighting while suggesting the best full-spectrum light sources and bulbs may be well worth the investment. Nature promotes happiness, and that’s why going to the ocean or mountains has a calming effect, Lawrence said. This is largely because the air contains negative ions, he explained. However, a similar calming effect could occur with large wall images containing visuals of nature. “You’re not getting the negative ions, but there is a calming effect,” he added. Dak Kopec, Ph.D., an associate professor and master of health care interior design at UNLV’s Paul B. Sogg School of Architecture, said research from the 1980s and ’90s involving children with attention deficit hyperactivity disorder showed these children were able to better control symptoms with brief and periodic exposure to nature. He and Lawrence recommend finding large digital technology images for the wall. Atmosphere North America, a Las Vegas-based company, offers a wall-hanging product that includes four televisions in the portrait position. Its “films and moods” setting allows people to have large nature scenes streaming throughout the day. Colors are displayed in a rich digital format and give depth to the room. The product has been used in bars, lounges and hotel rooms. Technology like this could be helpful for homeowners who have homes on small lots in crowded subdivisions and may feel boxed in, Kopec said. “In today’s housing market where land has become more valuable, many housing developments are placed too close to one another, and the ability to look off into the distance has been compromised by walls,” Kopec added. Lawrence also speaks to the importance of social interaction in a home and how it can encourage healthier, happier families. Today, multigenerational homes where grandparents are living with their children are becoming more common. 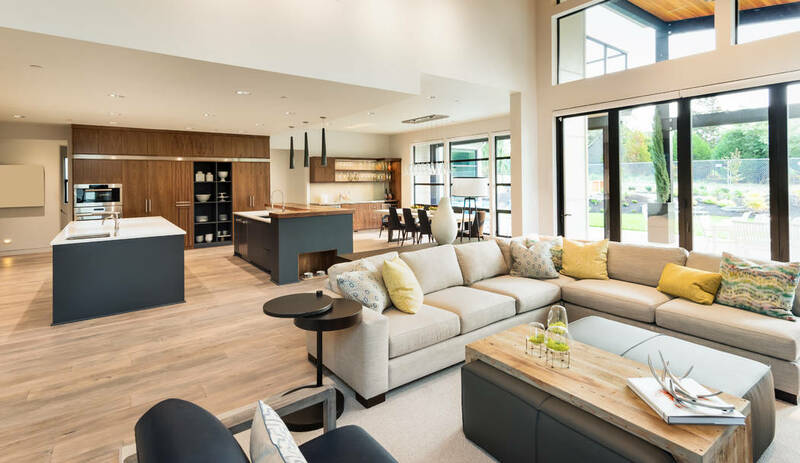 When it comes to the layout of a multigenerational home, Lawrence said it’s important to arrange environments in a way that allows for the inclusion of older family members. Arrange seating areas so that people are not more than 6 feet apart, he said, so that conversations can be easier to have, especially for a person who is hearing impaired. “A grandparent hard of hearing that is 10 feet away may not hear what’s being said. … This can lead to some level of isolation,” he added. Every faucet or showerhead in a home can directly contribute positively or negatively to one’s health. Having clean water available is critical, especially in a desert environment known for poor water quality. More than 90 percent of the valley’s water is recycled, and there is simply no way for the local water authority to purify it to a drinking water level, explained Greg Eisenhauer, general manager of Sunny Plumber in Las Vegas. Consumers should know there are basically three types of water systems available: water softeners, water filtration and reverse osmosis systems. Softeners only reduce the hardness of the water by exchanging one ion of calcium or magnesium for an ion of sodium or potassium — whichever is used by the homeowner. Softeners, however, do not eliminate chlorine, which municipalities use to keep dangerous bacteria at bay. Chlorine, however, is not good for one’s health. Other toxins like chromium also may also be present in the water. With water filters, Eisenhauer said, “Filtration is only as good as the media,” meaning whatever the filter is designed to remove, it will, but these systems often bring limitations. RO water, he added, removes all toxins, including chlorine. Some residents will seek out the local municipality’s water report to better understand which contaminants may still be in the water. Then they can seek out a filtration system that can remove the targeted toxins. Or they may spend more with a whole-house RO system. “The only way to purify is with RO. … A whole-house purification is expensive, but in the long run it’s worth it,” he added. LAS VEGAS (AP) – Real estate agents say median home prices in southern Nevada topped $229,000 in May. The Greater Las Vegas Association of Realtors reported Tuesday that the median sale price of existing single-family homes was up 8.5 percent, from about $211,000 a year ago. Condominium and townhome prices were up 5.4 percent from a year ago, at a median price of $118,000 last month. Association president Scott Beaudry says he thinks a tight housing supply is driving prices up. The organization says almost 3,350 existing homes, condominiums and townhomes sold in May, or about the same number as in May 2015. Beaudry says 4.5 percent of local sales in May were short-sales, for less than the value of the mortgage. That’s down from 7.3 percent of all sales a year ago. Las Vegas home prices went through a wild roller-coaster ride the past decade or so: they soared, crashed, shot up again, then downshifted. Today, the ride seems almost boring. For the first time in a long time, prices are flat. The median sales price of previously owned single-family homes — by far the bulk of Las Vegas’ for-sale housing market — has hovered around $220,000 since June. Prices still are up 7.5 percent year-over-year but have been roughly the same for the past nine months, according to the Greater Las Vegas Association of Realtors. The stalled prices are good for buyers — who wants to pay more for a house? — and industry analysts say the trend reflects a more stable and more normal market after years of price swings and other volatility. It also comes as investors, who revived Las Vegas’ resale market after the economy tanked, continue pulling out. The stagnation, however, could give sellers heartburn. And considering Las Vegas is the underwater capital of America, the plateau in prices prevents homeowners from escaping upside-down status. But Brian Gordon, a principal with Las Vegas-based Applied Analysis, said it was “probably a good thing over the long run” that prices have flattened. In a normal year, analysts say, home values grow 2 to 5 percent. After last decade’s boom and bust, resale prices for single-family homes grew 24 percent in both 2012 and 2013, 10 percent in 2014 and 6 percent last year, GLVAR data show. He said prices grew much faster than wages in recent years, but now they’d become “better aligned.” He also noted the economy was on “more-solid footing,” indicating a continued demand for homes. Gordon also pointed out that housing sales no longer were dominated by distressed properties, which blanketed the valley after the bubble burst. In 2012, bank-owned homes comprised 26 percent of single-family resales; short sales accounted for 37 percent; and “traditional” deals, or those not controlled by lenders, comprised 36 percent. In 2015, foreclosed homes comprised 7.7 percent of single-family resales; short sales, 7.5 percent; and traditional deals, 84.7 percent, according to the GLVAR. “Stability really has emerged,” Gordon said. Amid flat prices, house shoppers might have more time to save money for a down payment “without the worry of prices continuing to go up and possibly out of reach,” said Ralph McLaughlin, chief economist for San Francisco-based Trulia, a home-listing service. This, however, can create competition for sellers. For instance, they might have to spend more money to spruce up their house to lure a buyer, McLaughlin said. Overall, home-value growth around the country is “coming back down to Earth” and becoming “more sustainable,” said Aaron Terrazas, senior economist with Seattle-based listing service Zillow. But in cities like Las Vegas, he noted, the trend makes it harder for borrowers to get above water. Some 21 percent of Las Vegas-area homeowners with mortgages are underwater, meaning their debt outweighs their home’s value, according to Zillow. That’s down from a peak of 71 percent in early 2012 but still highest among large metro areas — reflecting how high prices soared during the bubble, how badly they crashed, and how much room they have before reaching peak levels again. Underwater borrowers typically can only sell their homes through short sales, in which lenders approve selling the property for less than what’s owed on the mortgage. It’s a potentially time-consuming, paperwork-heavy process that can badly bruise a seller’s credit score, and there’s no guarantee a bank will approve the deal. According to Terrazas, many underwater borrowers are unable to sell their homes. The result is a reduction in listings, especially among lower-priced houses that draw first-time buyers, he says. As Terrazas sees it, underwater borrowers will linger “for a long time,” especially in places like Las Vegas. Meanwhile, house prices have leveled off as investors, who gobbled up cheap homes in bulk after the economy crashed, have continued backing out amid the shrunken inventory of bargains and a crowded home-rental market. So-called institutional investors — or non-lenders who buy at least 10 homes per year — accounted for 2.2 percent of home purchases in the Las Vegas area last year. That’s down from 7.6 percent in 2014 and 14.1 percent in 2013, according to RealtyTrac. The result is the market must rely more on mom-and-pop buyers. If Las Vegas relied heavily on them a few years ago and didn’t have investors propping things up, the market would have stayed dormant much longer. Foreclosures, bankruptcies and short sales swept through the valley during the recession, wrecking people’s credit and making it all but impossible for many of them to buy a house for years. Today, Las Vegas’ economy remains at the bottom of the pack nationally in many ways. The valley’s unemployment rate, 6.5 percent, is second-highest among large metro areas, according to the U.S. Bureau of Labor Statistics, and its foreclosure rate is fifth-highest among metro areas, says RealtyTrac. But it’s on the mend — jobs are growing, mortgage lending is slowly climbing after falling for years, visitor levels hit a record-high last year — and mom-and-pop buyers appear to be picking up at least some of the slack from investors. Moreover, people sometimes forget that home prices typically grow just a few percentage points a year, said John Restrepo, founder of Las Vegas-based RCG Economics. The housing market is becoming “more normal,” and that’s not a bad thing, he said. Wednesday, March 23, 2016 | 2 a.m.